Who: Husband and wife, Mireya & Anders Rezabal, founded their estate in their native Basque Country in 1996. What: This rosé is relatively low in alcohol and lightly sparkling. An 80/20 blend of Hondarrabi Beltza and Hondarrabi Zuri. Farming Method: Sustainable Farming. Vines are grown atop Sandy-soil with layers of clay and the existing micro-climate (Atlantic climate). 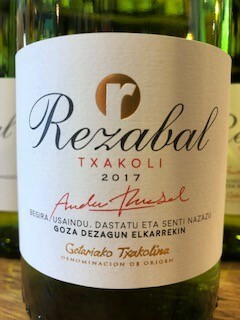 Fun Fact: There are two native varieties used to make Txakoli; Hondarribi Zuri and Hondarribi Beltza. What It Tastes Like: The flavor profile of this exceptional rosé initiated a long conversation with our entire staff. Descriptors that were suggested were lilies, hyacinths, dandelion stems, Hubba-Bubba bubble gum, wild strawberry leaves, grapefruit zest, and hay. It’s quite the complex rosé and definitely begets a conversation! Who: Mireya and Anders Rezabal have 15 hectares of traditionally high-trained vines, planted on steep, sea-side slopes that are cooled by nighttime breezes from the Cantabrian sea. Where: Galicia, Spain. Getariako Txakolina is a Spanish Denominación de Origen (DO) in the Basque area of Northern Spain located around small fishing towns on the Bay of Biscay. How: Pneumatic press, stainless steel tanks, controlled fermentation, cold stabilisation, modern bottling line. Fun Fact: The Getariako Txakolina DO is protected from the cold northerly winds by the coastal hills, and enjoys a relatively mild climate and moderate sunlight. Hail is a serious risk for the grapes, and rainfall is the highest in this region than any other Spanish regions. What It Tastes Like: Crisp, fresh and zingy, with notes of Granny Smith apple, lime and honeydew melon. A bit of CO2 is deliberately left over during bottling giving the wine a vibrant spritz! Who: Bodegas Familia Bastida was founded in 1950 by Antonio Bastida and is still family owned and operated. Fun Fact: The La Mancha region is the largest wine region in Spain and has an extreme continental climate with large fluctuations and variable rainfall. The clay and limestone soil comines to retain the moisture during the dry season to make the optimum environment for the vineyards. What It Tastes Like: Dark cherries and chocolate, with a slight hint of Uncle Fred’s cigar box. A food wine, while the Friend and Farmer Tempranillo below is fine just on it’s own. 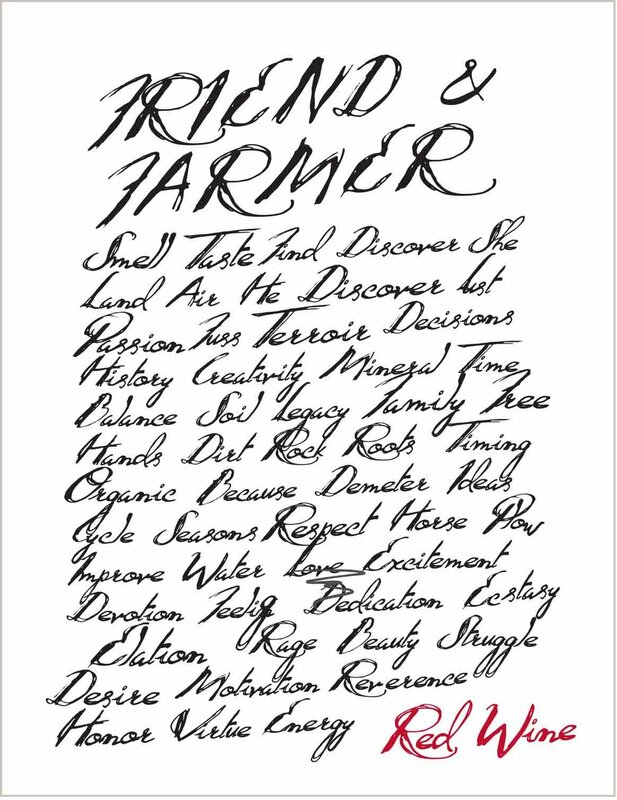 Who: Friend and Farmer is a 100% organic/biodynamic project from three bothers: Francisco, Javier and Luis Parra. The Parra brothers partnered with exceptional Juan Antonio Ponce (one of Susan’ faaaaavorite winemakers) of Bodegas Ponce. Farming Method: Friend and Farmer is Demeter and vegan certified with only naturally occurring sulfites. Fun Fact: .The Parra brothers work with grapes from two vineyards. The first is named Entresendas (‘Between Paths’), which is located atop rich, alluvial soils on a dried river bed, and ideal for vine drainage and sunlight retention. The second vineyard is Cuesta Colorá (‘The Colored Slope’), which is covered in chalky clay and retains hot daytime sunlight essential for vines as they cool off in the desert evening. What It Tastes Like: Citrusy and juicy, think Sauvignon Blanc meets Viognier. Notes of apples, white flowers, and lemonade. How: Vines are trained in the Guyot method. Named after Dr Jules Guyot, a 19th century French scientist, the Guyot system is a type of cane pruning, which requires manually cutting back nearly all the vine’s prior growth and correctly selecting a single cane (or two) that will be responsible for next season’s production. Fun Fact: Vines are grown on oolitic soils, which are composed on calcium carbonate, clay, iron minerals and more! What It Tastes Like: Juicy, red cherry notes. Easy-peasy drinking. Chill this red wine down and serve on a patio. It’s a spring time Home Run!